It is another bone chilling January day. Large piles of snow at the corners of many streets make for using extreme caution whenever driving around a corner. Now, this is a winter that we have not experienced for some time! A perfect day to reach into my freezer for a previously made dinner ready to reheat. 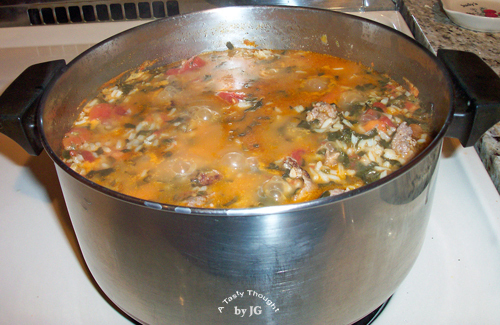 This past Saturday a pot of hearty Sausage Soup had simmered on my stove. Not the variety of soup that has a few veggies swimming in lots of broth, but the type of soup that makes a meal in itself. Rice, Spinach, Carrots & Sausage along with Tomatoes - Yum! We enjoyed a large warm bowl, along with Rye Bread, for dinner on Saturday. The remaining cooled Sausage Soup was placed into Ziploc containers, labelled and then stored in my freezer. Yesterday, after a busy day, it was so easy to reach into my freezer before dinner for a container of this hearty soup. It was defrosted and reheated along with 1 (14.5 ounce) can of College Inn Light & Fat Free Chicken Broth. Brown Sausage in skillet after removing from casings. Break into pieces as meat browns. Place cooked meat in large pot or Dutch Oven. Add Chicken Broth and heat. Add remaining ingredients. Simmer for 1 hour, stirring occasionally. **As this soup cools, the Rice absorbs the liquid. When reheating I add 1 can broth. Yesterday was definitely a New England winter wonderland! School children had a "Snow Day". Some children here in the Pioneer Valley enjoyed another day of sleeping late today. :) We were very aware that SNOW would be the word of the week and it sure is! In the afternoon my Slow Cooker bubbled away containing the ingredients for our warm, hearty, delicious, colorful dinner. Dinner was a cinch served over Barilla PLUS Farfalle Pasta. Only for special occasions do I purchase dinner rolls, so there were not any to dunk into the appetizing herbed tomato sauce containing green pepper slices. However, Garlic Parmesan Toast was my plan. For years my fam has enjoyed this easy substitute for dinner rolls. A Toaster Oven is a must to prepare these! The ingredients are always at hand: Sliced bread, Butter/Margarine, Parmesan Cheese and Garlic Powder. It is so easy to make and it is so tasty! Spread Butter/Margarine on bread slices. Finish by sprinkling with Garlic Powder, as desired. 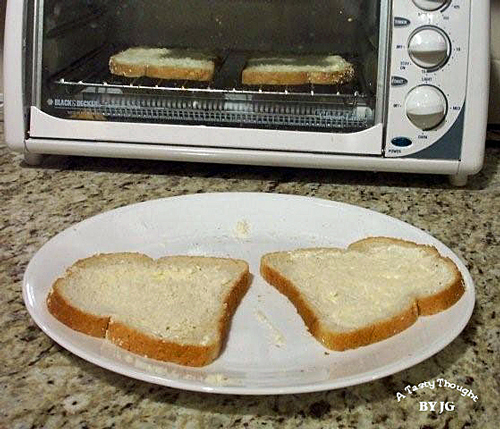 Toast bread slices in a Toaster Oven, as desired. Try these and you will enjoy! If garlic is not a fav in your fam, Parmesan Toast tastes mighty fine, also! Just skip the Garlic Powder. :) My bread of choice is Soft Oatmeal. There is always at least a half loaf in my freezer waiting to be used! This was Plan A! There was one Banana in the fruit bowl this morning! Now, I can remember when gazing over to a brown spotted Banana in the morning was not very appealing. The reasoning - it did not have that "just right for eating at lunchtime" appearance. But ... on these chilly mornings a hearty breakfast of Creamy Banana Oatmeal tastes so good! 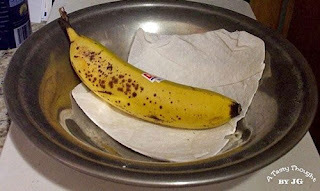 The lonely spotted Banana that contains Potassium sure helps make a yummy & healthy breakfast! I follow the directions on the Quaker Old Fashioned Oat canister. O.K., I admit one of the large packages of the dual pack of Quaker Old Fashioned Oats purchased from Costco has been divided and stored in my pantry. 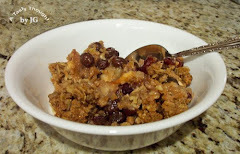 You know how I like to prepare foods using Old Fashioned Oats and enjoy their taste! :) The large box purchased from Costco is not really that big! Soy Milk, along with Cinnamon, Nutmeg & Raisins &/or Craisins, Brown Sugar (optional), and the Banana (sliced) are combined in a sauce pot. I do not use Salt. The Soy Milk replaces Whole or Low Fat Milk. Let the ingredients in the pot sit for 5 minutes before starting to cook according to directions on canister. The result is a creamy Oatmeal with a delicious taste of Banana. A great breakfast before heading outdoors! Do you prepare Oatmeal for breakfast? Do you cut out tear recipes from magazines or newspapers or bookmark them to save with the understanding that you will prepare a particular food, soon? I do. Cooking is never dull, because there are many more foods to taste! About two months ago in a pile of papers I found a recipe for "Peruvian Grilled Chicken". Surely it could not be true that I had saved it in 2007! Well, there it was in newsprint from our Springfield Republican - "(Recipe from the Sept. 2007 issue of Gourmet magazine)." Whoa! It was a November day and cold. Grilled Chicken sounded mighty good to me. 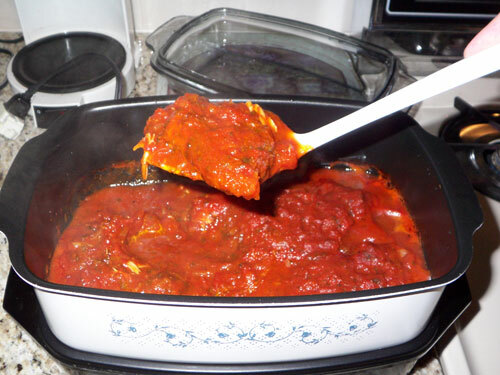 I used the original marinade and boneless skinless chicken breast halves rather than a whole cut up chicken. My George Foreman Grill works wonders quickly. That little grill is one handy little aide! 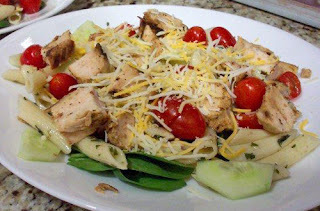 This savory grilled chicken was cut into pieces and added to a large salad for dinner. How's that for forgetting the cold weather outdoors? We enjoyed this dinner so much that yesterday, New Year's Day, Grilled Chicken Medley was served for dinner. Yummy! After preparing marinade, add 3 boneless skinless Chicken Breast halves to the Ziploc Gallon Freezer Bag. Place closed Ziploc Bag in/on a dish and refrigerate for 4 - 8 hours. Remove chicken from bag to drain. Do not save marinade. Then, grill each half chicken breast. (Using my George Foreman Grill, each thick chicken breast required 7 minutes.) **Grilling time depends on size/thickness of chicken. After grilling, cool chicken 5 minutes and cut into slices or pieces. Serve over a bed of Spinach with Cucumber slices and Cherry Tomatoes. The cooked Ziti with Parsley were in my fridge, so I added them in. :) Top with shredded cheese or Feta Cheese. If desired, add a little salad dressing. I grilled three pieces and used 1 piece per salad. Another quick, tasty meal with many veggies awaits with the 1 leftover Grilled Chicken piece. Why did I wait so long to try this recipe? It's absolutely delicious!